Throw a zombie across the screen. Then, drop a cement block on some of his friends. You can shoot, throw, and yes, smash a variety of undead monsters in ZombieSmash! a new game by Gamedoctors. Despite a surplus of zombie and defense games on the App Store, “ZombieSmash!” remains a refreshingly unique and unbelievably fun game. 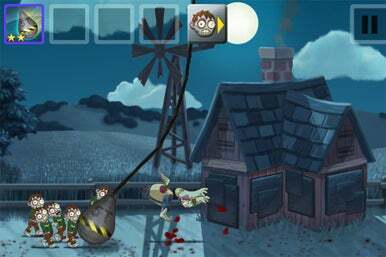 Full of memorable weapons, a great physics engine, and some genuinely funny moments, ZombieSmash! is a must-have app. I have no idea where this farm boy got a wrecking ball, but here it is. With the help of gravity, and an arsenal of weapons that would thrill even the most jaded zombie hunter, the player assists our unseen hero Joey in the violent defense of his farmhouse. You’ll have wrecking balls, guns, land mines, falling rocks and many other unconventional weapons at your disposal. The “splatter-engine” developed for this game lets the player dispose of the undead using some of the best working touch-screen controls I’ve played with. You can lift, throw and smash zombies into the ground with just a flick of the finger. The rag-doll physics and detachable body-parts of the zombies makes killing a ton of fun, the outrageous weapons add another layer of greatness. You can use your fingers to flick the zombies across the screen and watch limbs fly as they are then blown to pieces by landmines or shotgun blasts. Shoot off a zombie’s leg, and these persistent monsters will crawl after you. Gamedoctors spent a great deal of time on this app, and it shows. The weapons are well varied and fantastically fun to use, the sound effects are realistic and believable, and the physics engine creates a level of variety unseen in defense games. There are three modes of play: first, the campaign mode, which includes 31 stages, two difficulty levels, and the ability to unlock and upgrade weapons. The second mode is “Endless Siege,” a survivor mode in which you defend against wave after wave of zombies until you are overrun. Finally there is a “Sandbox” option, where the player has the ability to test out weapons and practice skills without worrying about dying. Though the game features no multiplayer, there is an extensive online community offering leader boards, news, and a message board. The gameplay, though great, is not perfect. There are times where the player is put in helpless situations in which a weapon is needed, but cannot be found. The guns are an important aspect of the gameplay but can extremely hard to aim (especially when you’re facing zombies from both sides of the house). Also, this game is simply begging for some sort of accelerometer usage, and more then one map would be nice. “ZombieSmash!” does an incredible job balancing fun game-play with replayablity. It’s great for some quick fun, but it still remains a blast after hours of throwing the little brain-eaters around. This is quite possibly the most addicting and entertaining game available in the app store to date and for $2 it is a must-have. Updated to correct the price of the app listed in the review at the time this article was published.